Navigating social etiquette whilst trying to get ahead in business can be a minefield. 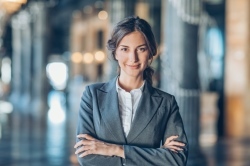 One of the main concerns for an individual trying to make it in their field can be the desire to assert themselves professionally without seeming aggressive. Many of us find it difficult to express ourselves confidently without becoming overwhelmed by emotion or thinking we are overstepping the line. Whether it comes to applying for a new job, aspiring towards a promotion or pay rise, resolving conflict within the workplace, or pushing ideas forward in a team, learning how to communicate in an assertive manner can provide you with considerable benefits. To be assertive is to act in a way that is self-assured, outspoken and confident without falling into the territory of being domineering or offensive. There are three different stances a person can take when interacting with others: passive, aggressive or assertive. Let’s take the following scenario into consideration to better understand how these different approaches can play out within the work environment. There has been a team meeting, and the boss praises a project that you have worked on for several months; she is obviously very impressed, and there is the potential of a promotion on the horizon. A passive response would be to downplay the achievement, shrugging it off with a remark such as “I didn’t do that much.” An aggressive response would be to become boastful and arrogant, replying with a statement like “Just as well you chose me for this project; no one else would have been as capable.” An assertive response allows for pride in your personal achievement whilst being grateful for the recognition, responding graciously with “Thank you very much, I’m so glad my hard work paid off.” Out of the three stances, it is easy to see which one would be most advantageous to the individual in question and make the employer feel the most at ease. It is perfectly acceptable, and often expected, for you to be a little pushy in business, as long as you are being courteous and considerate at the same time. Emailing to follow up on a job interview, for instance, is a practice that many law firms recommend but some individuals think will be too overbearing. Many companies actually cite the reason for choosing the candidate for the role as being their incentive to follow up after the interview; it shows passion and enthusiasm, not arrogance. Seeking a career isn’t meant to be non-participatory, and employers admire boldness. It is important, however, to always gauge the reactions of others whilst acting assertively – you then know whether to carry on full steam or to retract a little. Emotional intelligence comes into play here, with the ability to read other people’s emotions and respond in an appropriate manner for each different situation. One of the key points in assertive communication is diplomacy: the ability to listen to others’ needs and opinions and fully consider them before tactfully presenting your own. By recognising the thoughts and feelings of others, you are better able to understand the situation and everyone’s part in it. It then enables you to process your own thoughts about the situation in a more informed way and make better choices. Allow others to speak before you, but do not let your own voice go unheard. Be an active listener and time your responses well – for you to be listened to, you need to make others feel as though they are also heard. Always invite input from others around you, let them speak without interruption, acknowledge their contribution and ask further questions if needed. Cooperate with others, and allow your own vision to be adapted to include their input. By working collaboratively, all participants can add value to a situation. Make sure to always take a clear and objective judgement of the group around you and pay attention to others’ emotions carefully to ensure that you are not making anyone else feel uncomfortable. Another important factor is how well you are able to manage your emotions. Assertive individuals feel their self-worth and know the value of making their thoughts and desires heard, but won’t become angry if their pride gets knocked; they are capable of handling a fall with grace and amicability. If you are the kind of person whose temper flares up easily, you can start to practice self-calming techniques in your everyday life to stop reactions that may cause future damage to your career. If you feel anger rising, count to five in your head or take a timeout before offering your response. Remember that no one likes to feel threatened or dominated; therefore, aggressive body language or a raised voice is not appropriate when trying to assert yourself. Assertive people are able to work through and handle problems in a fair and emotionally stable way. Using a calm, even tone and open body stance when communicating with others will make them feel at ease with you. If you feel that assertive communication doesn’t come naturally to you, remember that it is a skill that can be practised and developed over time. Some of the most seemingly confident people have come from painfully shy pasts; it can be surprising the number of people who feel the same social vulnerability under the mask of what they present to others. Getting to know your colleagues personally can reveal some surprises which can make you feel more reassured about yourself and boost team morale. A good starting point is to start observing the behaviours of those around you and the reactions that they receive in return. Note the behaviours that you think are positive and would like to apply in your own life. You can then mimic these behaviours yourself in low-risk situations, such as in restaurants or with shop attendees or even the postman. Another good practice is to write down your thoughts clearly and formulate a speech, which you can then practise in the mirror. Use “I” statements to avoid distancing yourself from your ideas and seeming passive. After writing down your feelings, you can then analyse them for potential consequences and reactions, which you will also need to think about responses for. Planning in this way can make you feel more prepared and confident when you are on the spot. Practising assertiveness as another skill you have to hone to become successful in your career can act as a reassuring reminder that everyone is on their own path of learning, and this is a part of yours.